The graph is not very clear, but I think you can get the gist of it. 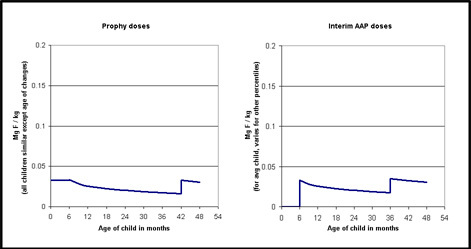 The main difference between the doses I recommend (graph on the left) and those of the AAP is the first 6 months. The AAP gives zero, where I give a dose by body weight of .033 mg F / kg. Later there is a little difference - I switch doses at a body weight and the AAP does it by age. What is the significance of these differences? Well, that's hard. Let me first try another graph just to see the differences. Cavities: The 6 month zone of no fluoride would theoretically cause a slight increase in cavities in the teeth that are forming during that first 6 months. The most interesting parts of the forming teeth are the tops of front baby teeth (see ECC page) and the chewing surfaces of the first permanent molars. White spots: The jumps at each step, especially from zero to .25 mg at age 6 months, would theoretically cause the pigmentation to shift to a whiter color. These doses are pretty low, so I would not expect a big change, but it could be barely visible. The position of the change should be a little different than what we have seen from the old doses when the jump was at birth. It should shift about an eighth of an inch up from the leading edge of the incisors. 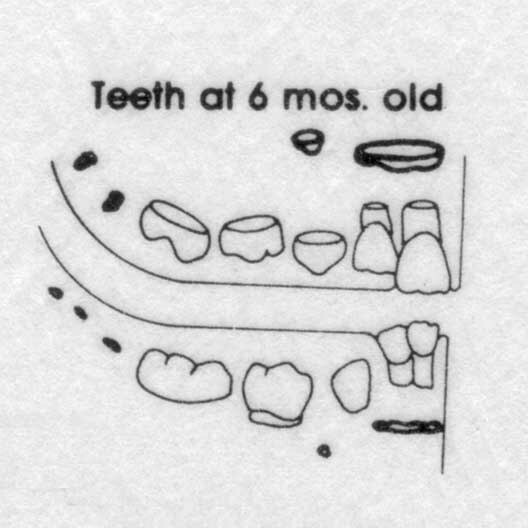 In the drawing above, of the teeth at age six months, you can picture where the action should be. The permanent teeth are shown in darker, bolder ink. On the permanent central incisors you can see the part that has just grown. With the old doses (high at birth), this is the part that has mild fluorosis. With the new doses, the mild fluorosis should be just above this part. In the back teeth you can see the chewing surfaces of the first permanent molars just forming. The baby teeth have grown quickly, and are just starting to errupt into the mouth. One of the trials was short - to about 5 years of age I think. It compared the zero-until-6-months group to a group that started at birth. It was a good trial but found no difference in caries. (Rats! But at age 5 most of the exposed teeth were formed in pregnancy, and we are not quite into enamel that formed with the various F levels.) And the kids weren't old enough to look for fluorosis yet. So I have to admit that at this point there is no proven* significance between starting at birth and at 6 months. So if you already think I am splitting hairs, don't read the next section on "zero start". I will argue for being even more persnickedy on doses.